Buying an engagement ring for your partner is one of the most important and difficult decisions that you will ever have to make. An engagement ring is a promise to love and cherish for all eternity. For that reason it should suit the person wearing it, not just in style but in color as well. The most popular choices for the metal are white gold, yellow gold and platinum. The choice that you make should depend on the preferences of your partner. Not all metals look good on everyone. Take a look through her jewelry box and see what she has. This should help to give you an idea of the types of jewelry and metal she prefers. Buying an engagement ring is an important decision and can be a major expense. Novori will save you money on your engagement ring purchase. We are able to help you with any questions you have while you are purchasing jewelry online. 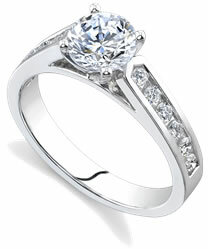 Budget is one of the most important aspects of the engagement ring selection process. How much do you have to spend? Do you have a large enough amount saved up? Financing options makes saving less important than it used to be. While it is still a good idea to pay for your engagement ring with savings, if you do not have any then financing can be a good option. Just remember to pay it off as soon as possible in order to save money on interest charges. Interest can really add up over time and you could very possibly end up paying two or three times as much as the original price of the engagement ring by going this route. When trying to find out how much you should spend on an engagement ring you will hear that it is best to spend at least two months' salary. This is not based on any study of what women prefer but rather just a guideline to use. Just focus on being able to purchase what would make your partner the happiest. If they want one that is that expensive then fine. Many women do not want to get into serious debt over an engagement ring. After all, once you are married, it becomes her debt too. Most men buy a ring and then surprise their loved one when they propose but what about the option of choosing a ring together? It's a difficult decision to make because the surprise aspect is wonderful when you choose it yourself but choosing the ring together can be much more practical. This allows you to pick a set of matching wedding bands or another stone that she may like better than a diamond. It can be hard to pick the perfect engagement ring without her help. You will have to consider these two options and choose the one that seems right for the two of you. Remember that Novori is here to help you as well.